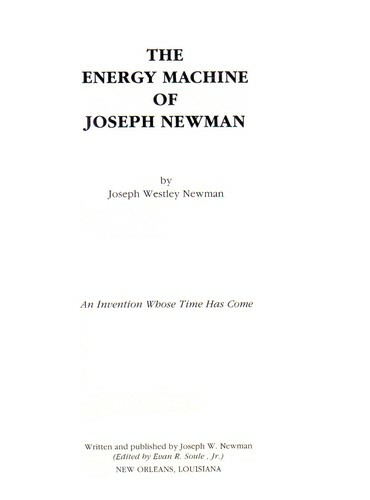 Are you sure you want to remove The energy machine of Joseph Newman from your list? Joseph Newman attempts to convince the reader that a coil can accumulate voltage in excess of its source if it is not cleverly shorted to itself via a parallel resistive load. Such was accomplished by the, then named, National Bureau of Standards. The RPM and torque of his device depends upon voltage, alone, since little current is allowed to pass through his primary coil due to its excessive length of 50 miles or more. Current wants to take the path of least resistance. Since 50 miles of wire exceeded the resistance of the NBS's load test, they concluded that Newman's device did not exceed its input power and, thus, did not produce overunity. 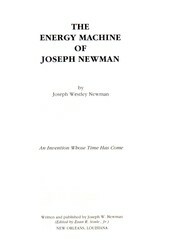 On the basis of that one error in testing Newman's device, the failed outcome of his patent dispute in Federal court hinged. Page 12, added by Vinyasi. "Describes the daunting task of any free thinker in pursuit of new horizons." December 27, 2017 Edited by Vinyasi It needs a review.